How to recover missing contacts from iPhone 6 with iOS 9.3.1? How to recover missing contacts from iPhone 6 with iOS 9.3.1? How to retrieve iPhone 6 lost contacts? Is there any way to get back missing contacts from iPhone 6? Don't worry and read here. It is quite easy to lose contacts or notes when linked iPhone via outlook or gmail due to sync issues, just as the above iPhone 6 user described. Here is the question: how to recover missing contacts from iPhone 6 with iOS 9.3.1? How to retrieve contacts from iPhone 6 lost due to some sync reason? When you are encountered with the similar problem here, don't panic and calm down. We have methods to help you get back lost contacts from iPhone 6 easily. Just keep reading and follow the steps listed below. In order to recover lost contacts from iPhone 6, what you need to know first is iFonebox, which is a professional iPhone contacts recovery tool enables you to recover deleted or lost text messages, wechat messages, whatsapp messages, notes, contacts, etc, from iPhone or iPad directly. Plus, if you have an iTunes or iCloud backup for those missing contacts, you can extract and restore them from iTunes or iCloud backup selectively not wiping any data on your iOS device, compared with restoring from backup directly. 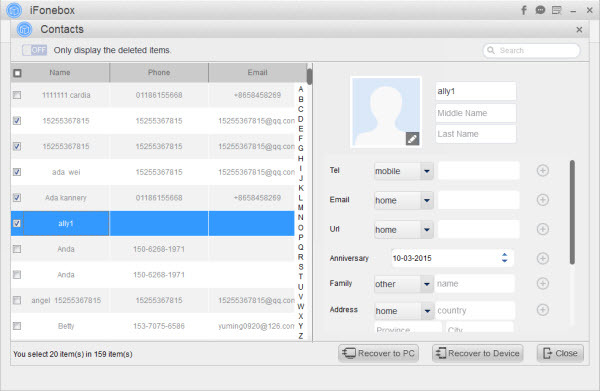 What's more, you can transfer recovered contacts back to your iPhone 6 directly. So cool and amazing. Definitely, it is necessary to download and install iFonebox on your computer firstly. Two versions are available: Windows version and Mac version. In a word, it is quite convenient to recover missing contacts from iPhone 6 within the help from iFonebox. PS: if you have an iTunes or iCloud backup for missing contacts, you can also choose Recover from iTunes Backup or Recover from iCloud Backup mode to retrieve lost contacts to iPhone.